Well Paul and Corel left this morning and took little Matilda with them - in fact she scrambled into the car as if she was pleased to be leaving! Didn't want a dog anyway! I've been busy today doing a story for GoRV - a couple who I believe have the ultimate RV are leaving in the morning so I seized the opportunity and asked a lot of questions and shot a lot of pictures. 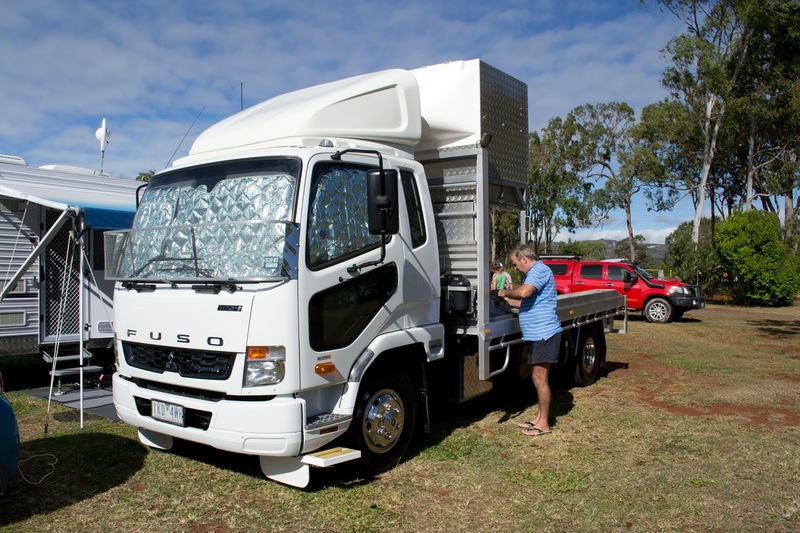 They have a tri-axle Roma caravan, a Fuso truck tug and a Mitsubishi Mirage run around. 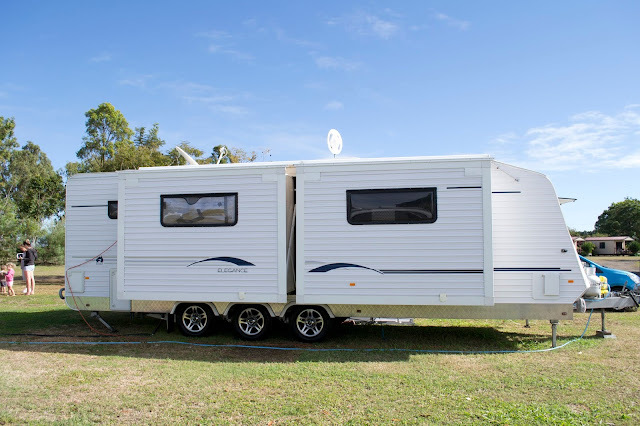 It has two slide-outs, solar on the roof and loose, an exterior kitchen and sink and all the goodies you could imagine. The little Mitsubishi rides on the tray of the truck. 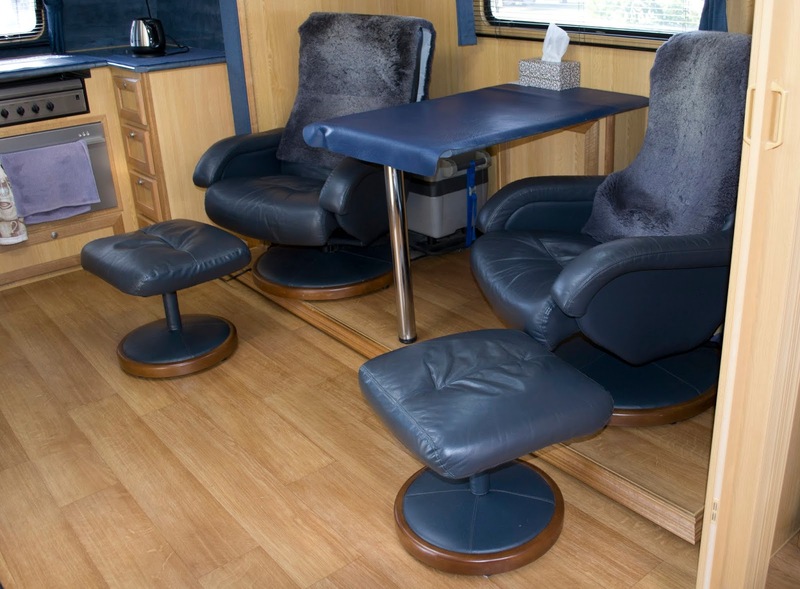 With two swiveling chairs with footstools, two tellys, an outside kitchen and sink, two generators, stacks of storage and much more, in my mind it's the ultimate RV. Keep watching for the story in GoRV sometime soon. When I left him Russell had twenty tyre pressures to check! I had a lovely chat tonight during happy hour with a couple from the newly formed ACC Branch - the ACC Rainforest Ramblers. They live in Cairns but come up to Walkamin quite often. They have a muster just after I leave to head westwards or I would have joined them. With Brian and Christine here from the Tassie Travellers that means we had the furthest north and south ACC branches represented here tonight! Not too many steps today as I've been a bit busy!